Pre-register for tryouts by clicking on the link below. After going to the above web page, click "New Signup," the "Add New Participant," and enter all the required fields at a minimum before clicking on "Save & Continue." You will then be taken to a Checkout screen. You will notice that there is no fee. This is because we have not activated this feature yet. The $10 registration fee will be collected at tryouts. Make sure you click "Finish Checkout." You will then be taken to a page that says "Thanks for Registering." You will also get an e-mail confirming your registration. Thank you and good luck to all players. Are you ready for competitive soccer? Open to all interested soccer players ages 8-18 who want to continue developing their skills in a more competitive environment. These tryouts are for the fall 2019 and spring 2020 seasons. Final teams are separated by age (U9-U18) and by gender. Cost to tryout is $10 a player. There are two tryout dates for each age group. Participation is required on both days unless special arrangement is made. Players will be placed on the team where they can best continue to develop their skills. No player is guaranteed a spot on a team. Location: Nellie & TK Nitterhouse Memorial Park, Home of the Chambersburg Youth Soccer Association, 375 West Washington Street, Chambersburg. What to wear: Shinguards are required! You should wear clothing as you would be playing or practicing. 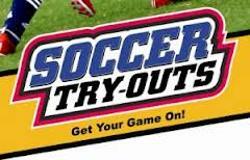 Information about how to join CYSA and player evaluations and how teams are formed.